Enjoy a delicious meal and award winning real ales from Hook Norton Brewery. Stunning setting with panoramic views across Warwickshire. The pub at Castle at Edgehill offers a large bar with three main dining areas including the relaxed library, the dining room and the glasshouse boasting a panoramic view across Warwickshire and the famous battlefield of the Battle at Edgehill. Serving award winning real ales and bottled beers from Hook Norton Brewery and offering a wide range of delicious food which can be enjoyed in a Castle or outside in our large landscaped gardens. So no matter if you're looking for the best food pub in Banbury or a romantic evening spent overlooking one of the best views in Warwickshire then you've come to the right place. Use the booking system to the left to reserve a table with us. Please note Tuesday night is Steak night here at The Castle - with a limited menu - as listed under 'menu's' - please call for further details. Here at The Castle unfortunately we can not promise nor guarantee any specific table or area, indoors or outdoors. For example; any requests for our glasshouse will be noted, but this does not guarantee you a table here, this is due to us having to cater for our seating plans and these are continuously changing, we shall of course do our utmost to fulfil any requests. Thank you. The Castle kitchen team have carefully selected some of the best local suppliers to support us in our mission of really pushing that extra mile to support and showcase some of the very best local suppliers we can find. Our menu will change around every 10 weeks. The Castle at Edgehill kitchen team have carefully selected some of the best local suppliers to support us in our mission of really pushing that extra mile to support and showcase some of the very best local suppliers we can find. Our menu will change around every 10 weeks. If you our a local supplier and you have a fantastic product, please do get in touch, we would love to here from you. Our ambitions is to produce a full seasonal menu that is completely produced within 30 miles of The Castle. We have also expanded our very own Castle at Edgehill Garden with more herbs and vegetables. A red grape that thrives on heat and dryness. Fermented in open top, stainless steel tanks ensuring fine tannin and colour. After fermentation, half the wine is aged in vats and half the wine is aged in wooden barrels. The wine is then re-blended to give rich black fruit and spice flavours with a hint of Oak. From the Bordeaux Satellite region of Cahors, an area which is now producing rich, powerful wines that are developing cult status in the UK. This top Malbec is deep, concentrated and perfect with any red meat. Fessy is a significant grower in Beaujolais specialising in the Cru areas, producing wines that show perfectly what the Gamay grape is best for. This Fleurie is a juicy fruit driven medium bodied red, perfect with most dishes due to its lighter style. Unusual and somewhat rare Rioja Rosé, deep pink in colour this wine is most definitely off dry and bursting with Strawberry and summer fruit flavours. Light rosé colour. Elegant and intense bouquet. Dry, soft and well balanced on the palate; round and full bodied structure. Enjoy this wine when still young to fully appreciate the sparkle (perlage) fragrance and flavour. Pale gold with a flourish of delicate bubbles and enticing lemon cream and almond Biscotti precedes a soft explosion of zesty lemon and orange peel that finishes with appealing length and freshness. This wine is a fantastic alternative to Prosecco, made in the traditional way by secondary fermentation. Superb value Champagne, light and expressive, with white flower aromas and an elegant long finish. Where better to enjoy English sparkling wines than at a traditional English pub. Top English sparklers are beginning to rival Champagne in quality and are achieving cult recognition. Herbert Hall’s traditional Brut has been listed by some of the best wine lists in the country, including Michel Roux’s; Le Gavroche. A palate of considerable depth and balance with hints of honey and fresh fruit with a long, fresh finish. Selection of Hook Norton Ales. Hook Norton brewery is a mere twenty minutes away from our lovely home and they have been brewing ever since 1856! With many awards for their beers they have now created their own ‘micro-brewery’ with wonderful craft ales being produced each week. Just ask a member of Team Castle for the selection of ales on offer today. Please ask a member of ‘Team Castle’ for any cocktail specials. Please note, our menus can change slightly from time to time due to seasonal produce availability. AA Rosettes are awarded solely by AA Hotel and Restaurant Inspectors with no influence from hotels, restaurants or other guides. The AA Rosette scheme is long established and successfully recognises cooking at different levels nationwide. 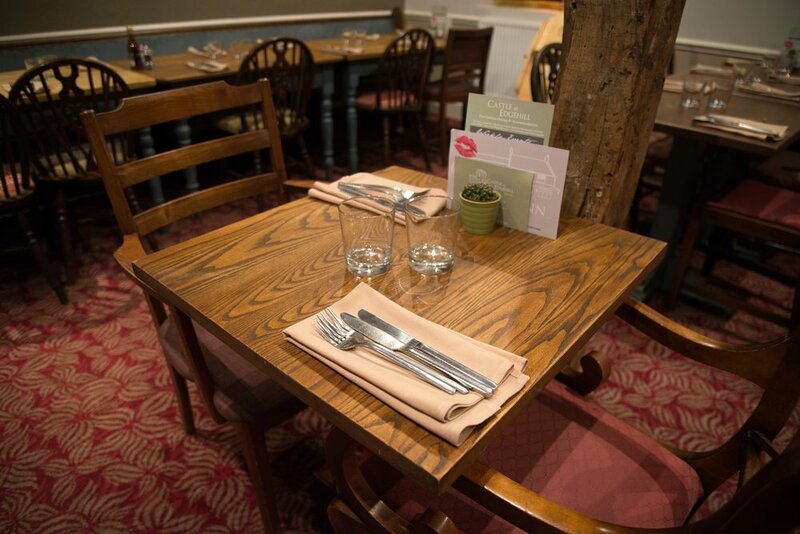 Our ingredients and the skill of our chefs make us the best food pub in Banbury.